What’s up with Easter Bunnies, Eggs, & Candy? Bunnies, eggs, and candy are common sights for Easter, but some of us at Scranberry Coop wondered why these secular symbols are even associated for what is known as a Christian holiday. So we did some research, and have found some explanations for the presence of bunnies, eggs, and candy in Easter. What’s up with Easter Bunnies? (according to history.com)? The exact origins of this mythical mammal are unclear, but rabbits, known to be prolific procreators, are an ancient symbol of fertility and new life. 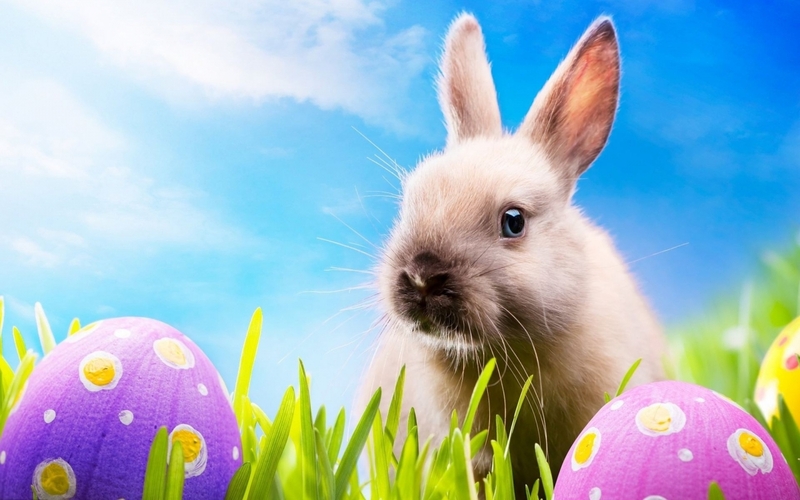 According to some sources, the Easter bunny first arrived in America in the 1700s with German immigrants who settled in Pennsylvania and transported their tradition of an egg-laying hare called “Osterhase” or “Oschter Haws.” Their children made nests in which this creature could lay its colored eggs. Eventually, the custom spread across the U.S. and the fabled rabbit’s Easter morning deliveries expanded to include chocolate and other types of candy and gifts, while decorated baskets replaced nests. The egg, an ancient symbol of new life, has been associated with pagan festivals celebrating spring. From a Christian perspective, Easter eggs are said to represent Jesus’ emergence from the tomb and resurrection. Decorating eggs for Easter is a tradition that dates back to at least the 13th century, according to some sources. One explanation for this custom is that eggs were formerly a forbidden food during the Lenten season, so people would paint and decorate them to mark the end of the period of penance and fasting, then eat them on Easter as a celebration. Easter takes place at the end of Lent, a 40-day period of fasting and contemplation for Christians. Fasting was a bit more intense in the medieval world. Meat and animal products (including eggs and dairy) would have been off-limits for all of Lent for most people. Once Easter hit, people would celebrate with a feast, which might even take place at the home of the local lord. So, while the eating yourself into a Peeps-induced coma on Easter is certainly a modern concept, the idea of indulging once Lent ends dates back quite a while. Sign up for our newsletter for updates & announcements!